Store bought brussels sprouts are very bitter. All plants in the Cruciferae family are like that. Home grown sprouts are yummy! The first picture is from May of 2000. The second picture is from August of 2000. 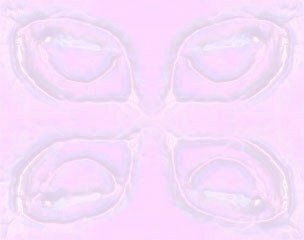 They are still not ripe, it takes a long time for sprouts to mature. They will be my winter time treat. Sprouts survive in the garden all winter and I can go out and pick some any time I like. In case you are wondering, yes these plants are supposed to be purple. Most veggies come in many different colors. But unless you grow your own you will never see many of the colors. I prefer to grow red or purple Cruciferae because the bugs seem to prefer the green ones. I grow everything organically, I control the aphids by simply squirting them off with a hose. If you live in the Pacfic Northwest you might want to plant lots of plants in the cabbage family. 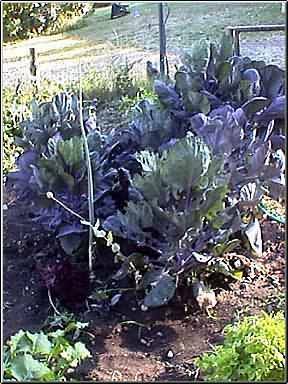 The cabbage (Cruciferae) family is well adapted to our climate and will give you a good crop even in the coolest of summers. All of the worlds commercial cabbage seeds are grown right here in Mount Vernon. 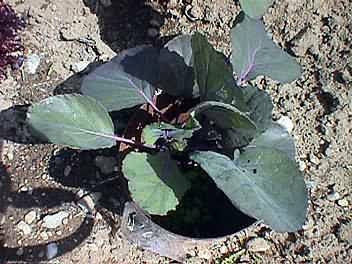 Cabbage can with stand lots of rain with it's thick waxy leaves. Some cabbages can also endure our frost all winter long. Cabbage becomes sweeter after the first frost because it's sap turns into a sweet tasting anti-freeze in response to cold weather.